Yesterday on our Tampa Museum of Art break, we dropped by the Gasparilla Festival of Arts Festival, where at least a hundred artists were exhibits and perhaps selling their wares. From blown glass to metal to paintings and jewelry. It was fun trying to fly through there to get to the museum, where I eventually bought this Pomegranate magnet. But, Matisse was right. 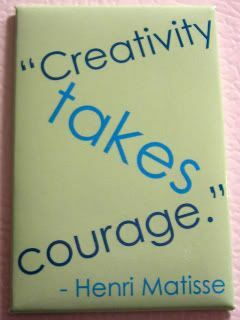 Being creative does take courage to execute. It's taking what's in your heart and soul and putting it out there in some sort of canvas for all the world to see. Whether it's brainstorming ideas for a golf event, concepting advertising on TV to sell something to people who don't want it, a painting for a gallery or just drawing with crayons, it's art without a safety net. My friend says sometimes the courage is in taking something you've created and calling it art. I think it doesn't matter how good or bad it is. Share it. Get it out on the canvas, because if it stays in your heart and soul, what's the point? Now you're making me miss home. You are down there at a great time. Gasparilla is fun and try to hit the Strawberry Festival if you get a chance. Sorry, sorry! That's likely the last time I'll see Tampa. Things gear up this week, so I'm totally gonna be completely crazy from here on out. No more breaks, methinks. Oiy. I was very sad to miss the Strawberry Festival, though.